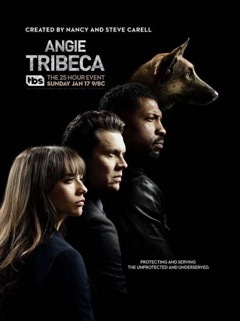 If you were giving an award for jokes per minute, ANGIE TRIBECA would blow away all competition. The bonus: It is incredibly funny. Rashida Jones is Angie. She’s a detective in Los Angeles. Her partner is J. Geils. There’s a cop who’s a dog. Not a K9, an actual detective who is a dog but the other cops don’t ever acknowledge he’s not human. It is in the vain of AIRPLANE and NAKED GUN. No mugging for the camera after delivering the joke. No time. You’d miss the next one. No laugh track. No need. You’ll know where to laugh. I had to rewind a few times because I had missed something while I was cracking up. And the guest stars in the pilot!!! Alfred Molina, Nancy Walls Carrell (she and husband Steve co-created the series), Lisa Kudrow, Gary Cole and Los Angeles Mayor Eric Garcetti who plays a cop and is actually really good (better than his real job. Sorry, I’ll leave politics for another time). I’m sure I’ve seen some of these set ups in AIRPLANE, NAKED GUN or POLICE SQUAD but it doesn’t matter. It is still uproariously funny. TiVO is set. Monday nights on TBS. ANGIE TRIBECA is brilliant! !